Bethany Logan is a dancer, choreographer, and teaching artist. She graduated from Ohio University with a BFA in Dance & Choreography, a Minor in Psychology, and is a 200-Hour Registered Yoga Teacher and a Certified Personal Trainer. 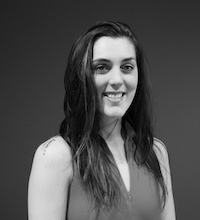 Bethany is passionate about empowering youth and using dance as a platform to do just that. She is thrilled to be apart of Dancewave as a Coaching Artist, and also teaches at The Brooklyn Dance Centers and femcho*. Logan currently dances with Chris Ferris & Dancers and Kelley Donovan & Dancers. Past performances include The Physical Plant, Sandra Kramerova & Artists, The Median Movement, Doug Neilson, Thodos Dance Chicago, and Dance Kaleidoscope. Bethany’s choreography, Pani (2014), was selected to be performed in the American College Dance Association’s Gala Concert in March 2015. She’s also choreographed for University of Dayton Dance Ensemble and performed her own choreography in Mumbai, India, where she also studied Prana Paint Flow with Navdhara India Dance Theatre. She received Ohio University’s College of Fine Arts Award to study Ohad Naharin’s Gaga technique with Batsheva dancer, Shaked Dagan, in Italy in 2014, and completed a dance administration internship with Doug Varone & Dancers in 2012.